Bakić’s sculpture Lovers is his post-war work, but it belongs to the sphere which sought its roots in global art and not in the domain of socialist realism. 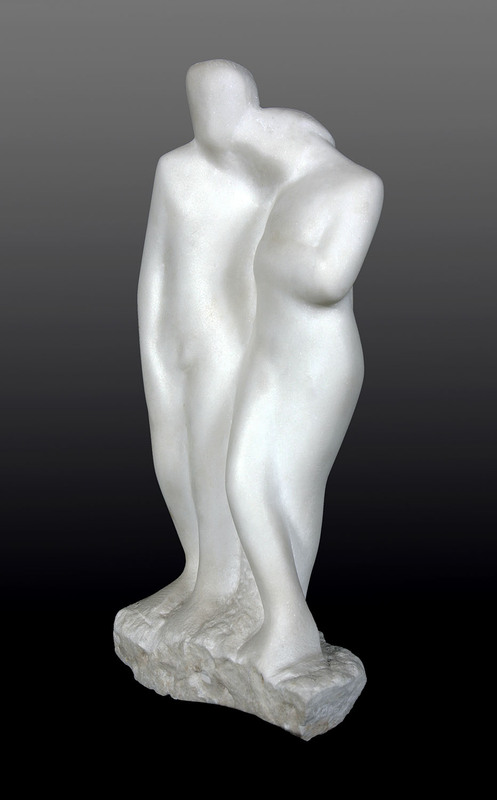 As an artist Bakić evolved from a traditional approach, over simplified, associative forms with rounded volumes to geometric constructivist sculptures. Although small in format, the sculpture Lovers is an example of that transience from the traditional to abstract and semi–figurative. The play of volumes, rounded forms and light as well as the styled forms are the main characteristics of this work. Vojin Bakić.- He graduated in 1939 from the Academy of Fine Arts in Zagreb, and subsequently attended the specialised course of Frano Kršinić. He had his first solo exhibition in Bjelovar in 1940, when he exhibited his sculptures and drawings. During World War II he was arrested and spent a month in the prison of Croatian pro–fascist collaborators – ustashas. Not affiliated with any political movement, he believed that art was more important than any ideology. During the war, in 1943, he exhibited in Berlin, and later in Vienna. After 1945 he was considered a victim of the ustasha terror and became close to the ruling party. He received important commissions for public monuments: Call to Insurrection in Bjelovar (1946) and monument to the victory of the revolution of Slavonian people (1968). At the Venice Biennial he exhibited his sculpture Bull (1950), an overlapping of abstraction, cubism and expressionism. Vojin Bakić was one of the most prominent representatives of modern Yugoslav sculpture, especially in the domain of public monuments. He was one of the few Yugoslav artists who achieved a truly international career. He took part in the most important exhibitions of plastic arts in the world (Venice Biennial, Dokumenta in Kassel, Sao Paolo Biennial). His works can be found in Antwerp, Marle, Mainz. He received a number of important awards.